The United States Census Bureau (USCB; officially the Bureau of the Census, as defined in Title 13 U.S.C. § 11) is a principal agency of the U.S. Federal Statistical System, responsible for producing data about the American people and economy. The Census Bureau is part of the U.S. Department of Commerce and its director is appointed by the President of the United States. The Census Bureau's primary mission is conducting the U.S. Census every ten years, which allocates the seats of the U.S. House of Representatives to the states based on their population. The Bureau's various censuses and surveys help allocate over $400 billion in federal funds every year and it helps states, local communities, and businesses make informed decisions. The information provided by the census informs decisions on where to build and maintain schools, hospitals, transportation infrastructure, and police and fire departments. In addition to the decennial census, the Census Bureau continually conducts dozens of other censuses and surveys, including the American Community Survey, the U.S. Economic Census, and the Current Population Survey. Furthermore, economic and foreign trade indicators released by the federal government typically contain data produced by the Census Bureau. Article One of the United States Constitution (section II) directs the population be enumerated at least once every ten years and the resulting counts used to set the number of members from each state in the House of Representatives and, by extension, in the Electoral College. The Census Bureau now conducts a full population count every 10 years in years ending with a zero and uses the term "decennial" to describe the operation. Between censuses, the Census Bureau makes population estimates and projections. In addition, Census data directly affects how more than $400 billion per year in federal and state funding is allocated to communities for neighborhood improvements, public health, education, transportation and more. The Census Bureau is mandated with fulfilling these obligations: the collecting of statistics about the nation, its people, and economy. The Census Bureau's legal authority is codified in Title 13 of the United States Code. The Census Bureau also conducts surveys on behalf of various federal government and local government agencies on topics such as employment, crime, health, consumer expenditures, and housing. Within the bureau, these are known as "demographic surveys" and are conducted perpetually between and during decennial (10-year) population counts. The Census Bureau also conducts economic surveys of manufacturing, retail, service, and other establishments and of domestic governments. Between 1790 and 1840, the census was taken by marshals of the judicial districts. The Census Act of 1840 established a central office which became known as the Census Office. Several acts followed that revised and authorized new censuses, typically at the 10-year intervals. In 1902, the temporary Census Office was moved under the Department of Interior, and in 1903 it was renamed the Census Bureau under the new Department of Commerce and Labor. The department was intended to consolidate overlapping statistical agencies, but Census Bureau officials were hindered by their subordinate role in the department. An act in 1920 changed the date and authorized manufacturing censuses every two years and agriculture censuses every 10 years. In 1929, a bill was passed mandating the House of Representatives be reapportioned based on the results of the 1930 Census. In 1954, various acts were codified into Title 13 of the US Code. By law, the Census Bureau must count everyone and submit state population totals to the U.S. President by December 31 of any year ending in a zero. States within the Union receive the results in the spring of the following year. The United States Census Bureau defines four statistical regions, with nine divisions. The Census Bureau regions are "widely used...for data collection and analysis". The Census Bureau definition is pervasive. Create localized areas for elections, schools, utilities, etc. The United States Census Bureau is committed to confidentiality, and guarantees non-disclosure of any addresses or personal information related to individuals or establishments. Title 13 of the U.S. Code establishes penalties for the disclosure of this information. All Census employees must sign an affidavit of non-disclosure prior to employment. The Bureau cannot share responses, addresses or personal information with anyone including United States or foreign government and law enforcement agencies such as the IRS or the FBI or Interpol. "Providing quality data, for public good—while respecting individual privacy and, at the same time, protecting confidentiality—is the Census Bureau's core responsibility", "Keeping the public's trust is critical to the Census's ability to carry out the mission as the leading source of quality data about the Nation's people and economy." Only after 72 years does the information collected become available to other agencies or the general public. Despite these guarantees of confidentiality, the Census Bureau has some history of disclosures to other government agencies. In 1918, the Census Bureau released individual information regarding several hundred young men to the Justice Department and Selective Service system for the purpose of prosecutions for draft evasion. During World War II, the United States Census Bureau assisted the government's Japanese American internment efforts by providing confidential neighborhood information on Japanese-Americans. The Bureau's role was denied for decades but was finally proven in 2007. United States census data are valuable for the country's political parties; Democrats and Republicans are highly interested in knowing accurate number of persons in their respective districts. These insights are often linked to financial and economic strategies that are central to federal, state and city investments for locations of particular populations. Such apportionments are designed to distribute political power across neutral spatial allocations; however, "because so much is at stake, the census also runs the risk of being politicized." Such political tensions highlight the complexity of identity and classification; some argue that unclear results from the population data "is due to distortions brought about by political pressures." One frequently used example includes ambiguous ethnic counts, which often involves underenumeration and/or undercounting of minority populations. Ideas about race, ethnicity and identity have also evolved in the United States, and such changes warrant examination of how these shifts have impacted the accuracy of census data over time. The United States Census Bureau began pursuing technological innovations to improve the precision of its census data collection in the 1980s. Robert W. Marx, the Chief of the Geography Division of the USCB teamed up with the US Geological Survey and oversaw the creation of the Topologically Integrated Geographic Encoding and Referencing (TIGER) database system. Census officials were able to evaluate more sophisticated and detailed results that the TIGER system produced; furthermore, TIGER data are also available to the public. And while the TIGER system does not directly amass demographic data, as a geographic information system (GIS), it can be used to merge demographics to conduct more accurate geospatial and mapping analysis. The Census Bureau distributes data it collects via censuses and surveys on its American FactFinder website. A survey is a method of collecting and analyzing social, economic, and geographic data. It provides information about the conditions of the United States, states, and counties. Throughout the decade between censuses, the bureau conducts surveys to produce a general view and comprehensive study of the United States' social and economic conditions. Since 1903, the official census-taking agency of the United States government has been the Bureau of the Census. The Census Bureau is headed by a Director, assisted by a Deputy Director and an Executive Staff composed of the associate directors. The Census Bureau has had headquarters in Suitland, Maryland, since 1942. A new headquarters complex was completed in 2007 and supports over 4,000 employees. The Bureau operates regional offices in 6 cities: New York City, Philadelphia, Chicago, Atlanta, Denver, and Los Angeles. The National Processing Center is in Jeffersonville, Indiana. Additional temporary processing facilities facilitate the decennial census, which employs more than a million people. The cost of the 2000 Census was $4.5 billion. During the years just prior to the decennial census, parallel census offices, known as "Regional Census Centers" are opened in the field office cities. The decennial operations are carried out from these facilities. The Regional Census Centers oversee the openings and closings of smaller "Area Census Offices" within their collection jurisdictions. The estimated cost of the 2010 Census is $14.7 billion. 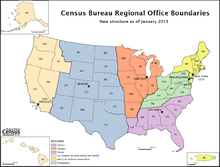 On January 1, 2013, the Census Bureau was to consolidate its 12 regional offices into 6. Increasing costs of data collection, changes in survey management tools such as laptops and the increasing use of multi-modal surveys (i.e. internet, telephone, and in-person) has led the Census Bureau to consolidate. The remaining regional offices will be in: New York City, Philadelphia, Chicago, Atlanta, Denver, and Los Angeles. The Census Bureau also runs the Census Information Center cooperative program that involves 58 "national, regional, and local non-profit organizations". The CIC program aims to represent the interests of underserved communities. A card puncher, part of the tabulation system used to compile the thousands of facts gathered by the Bureau (circa 1940). Holes are punched in the card according to a prearranged code transferring the facts from the census questionnaire into statistics. The 1890 census was the first to use the electric tabulating machines invented by Herman Hollerith. For 1890–1940 details, see Truesdell, Leon E. (1965). The Development of Punch Card Tabulation in the Bureau of the Census, 1890-1940: With outlines of actual tabulation programs. US GPO. In 1946, knowing of the Bureau's funding of Hollerith and, later, Powers, John Mauchly approached the Bureau about early funding for UNIVAC development. A UNIVAC I computer was accepted by the Bureau in 1951. Historically, the census information was gathered by census takers going door-to-door collecting information in a ledger. Beginning in 1970 information was gathered via mailed forms. To reduce paper usage, reduce payroll expense and acquire the most comprehensive list of addresses ever compiled, 500,000 handheld computers (HHCs) (specifically designed, single purpose devices) were used for the first time in 2009 during the address canvassing portion of the 2010 Decennial Census Project. Projected savings were estimated to be over $1 billion. The HHC was manufactured by Harris Corporation, an established Department of Defense contractor, via a controversial contract with the Department of Commerce. Secured access via a fingerprint swipe guaranteed only the verified user could access the unit. A GPS capacity was integral to the daily address management and the transfer of gathered information. Of major importance was the security and integrity of the populace's private information. Enumerators (information gatherers) that had operational problems with the device understandably made negative reports. During the 2009 Senate confirmation hearings for Robert Groves, President Obama's Census Director appointee, there was much mention of contracting problems but very little criticism of the units. In rural areas, the sparsity of cell phone towers caused problems with data transmission to and from the HHC. Since the units were updated nightly with important changes and reprogramming, operator implementation of proper procedure was imperative. Dramatic dysfunction and delays occurred if the units were not put into sleep mode overnight. ^ "U.S. Census Bureau Strategic Plan FY 2013 – 2017" (PDF). United States Census Bureau. April 2013. ^ "BNL Consulting". bnlconsulting.com. Retrieved 2017-01-20. ^ a b "Analysis | The U.S. census is in trouble. This is why it's crucial to what the nation knows about itself". Washington Post. Retrieved 2017-05-15. ^ "Census Population Estimates". U.S. Bureau of the Census. Archived from the original on December 6, 2006. ^ "U.S. Census Frequently Asked Questions" (PDF). Archived from the original (PDF) on July 23, 2017. Retrieved October 4, 2017. ^ History 1790 Archived October 7, 2013, at the Wayback Machine. US Census Bureau. ^ History 1840 Archived March 3, 2009, at the Wayback Machine. US Census Bureau. ^ History: 1900 Overview. US Census Bureau. ^ a b History 1920 Archived March 3, 2009, at the Wayback Machine. US Census Bureau. ^ History 1954 Archived July 27, 2009, at the Wayback Machine. US Census Bureau. ^ United States Census Bureau, Geography Division. "Census Regions and Divisions of the United States" (PDF). Archived from the original (PDF) on January 7, 2013. Retrieved February 3, 2016. ^ "The National Energy Modeling System: An Overview 2003" (Report #:DOE/EIA-0581, October 2009). United States Department of Energy, Energy Information Administration. ^ "The most widely used regional definitions follow those of the U.S. Bureau of the Census." Seymour Sudman and Norman M. Bradburn, Asking Questions: A Practical Guide to Questionnaire Design (1982). Jossey-Bass: p. 205. ^ a b "Census Bureau Regions and Divisions with State FIPS Codes" (PDF). US Census Bureau. Retrieved February 3, 2016. ^ "72-Year Rule". www.census.gov. Retrieved 20 November 2015. ^ Nobles, Melissa (2000). Shades of Citizenship: Race and the Census in Modern Politics. Stanford, CA: Stanford University Press. p. ix. ISBN 9780804740135. ^ Breiman, Leo (1994). "The 1991 Census Adjustment: Undercount or Bad Data?". Statist. Sci. 9 (4): 458–475. doi:10.1214/ss/1177010259. Retrieved November 17, 2017. ^ Anderson, Margo; Fienberg, Stephen (1999). Who Counts? : The Politics of Census-Taking in Contemporary America. Russell Sage Foundation. p. 17. doi:10.7758/9781610440059 (inactive 2018-12-31). ISBN 978-1-61044-005-9. JSTOR 10.7758/9781610440059. ^ a b Petersen, William (1987). "Politics and the Measurement of Ethnicity". In Alonso, William; Starr, Paul. The Politics of Numbers. Russell Sage Foundation. pp. 187–234. ISBN 978-1-61044-002-8. ^ Ahmad, Farah; Hagler, Jamal (February 6, 2015). "Government collection of race and ethnicity data". Center for American Progress. Center for American Progress. Retrieved November 18, 2017. ^ "Robert W. Marx". American Association of Geographers Newsletter. Vol. 45 no. 3. p. 14. ^ Ostenso, John (1991). "The Statistics Corner: More New Products from the Census Bureau". Business Economics. 26 (4): 62–64. JSTOR 23485837. ^ Harper, Beth (March 24, 2010). "American FactFinder Guide". University of Wisconsin–Madison. Archived from the original on April 7, 2014. Retrieved June 18, 2011. ^ "List of All Surveys". Census.gov. Retrieved April 4, 2015. ^ "NAMCS/NHAMCS - Ambulatory Health Care Data Homepage". www.cdc.gov. August 20, 2018. ^ "NHDS - National Hospital Discharge Survey Homepage". www.cdc.gov. January 10, 2018. ^ "NNHS - National Nursing Home Survey Homepage". www.cdc.gov. September 12, 2018. ^ Directorate, US Census Bureau Economic. "US Census Bureau Business and Industry Main Page". www.census.gov. ^ "Survey of Market Absorption of Apartments - Overview". www.census.gov. ^ Bureau, US Census. "Survey of Program Dynamics". www.census.gov. ^ Bureau, US Census. "Residential Finance Survey (RFS)". www.census.gov. ^ here, US Census Bureau Creating office name. "US Census Bureau Site Name main page". www.census.gov. ^ Bureau, US Census. "Annual Wholesale Trade Survey (AWTS)". www.census.gov. ^ "A Restructuring of Census Bureau Regional Offices". U.S. Bureau of the Census. Archived from the original on June 11, 2012. Retrieved June 21, 2012. ^ "Census Bureau Regional Office Boundaries" (PDF). U.S. Bureau of the Census. Retrieved June 21, 2012. ^ "Census Information Centers". U.S. Bureau of the Census. Archived from the original on May 16, 2008. Retrieved May 13, 2008. ^ History 1890 Archived May 3, 2009, at the Wayback Machine US Census Bureau. ^ Stern, Nancy (1981). From ENIAC to UNIVAC: An appraisal of the Eckert-Mauchly Computers. Digital Press. ISBN 978-0-932376-14-5. ^ Bashe, Charles J.; et. al (1986). IBM's Early Computers. MIT. ISBN 978-0-262-02225-5. ^ Weinberg, Daniel. "Management challenges of the 2010 U.S. Census" (PDF). U.S. Census Bureau. Retrieved 29 December 2015. ^ House Committee on Oversight and Reform, Subcommittee on Information Policy, Census and National Archives, "Chairman Clay Pleased With Census Address Canvassing Progress". June 08, 2009. Dead link fixed via Internet Archive. Retrieved 9 August 2013. ^ a b Wade-Hahn ChanMar 28, 2008 (2008-03-28). "Have feds cheapened contract bonuses?". FCW. Retrieved 2013-08-09. ^ "Census getting back on course, lawmakers told - Oversight". GovExec.com. Retrieved 2013-08-09.